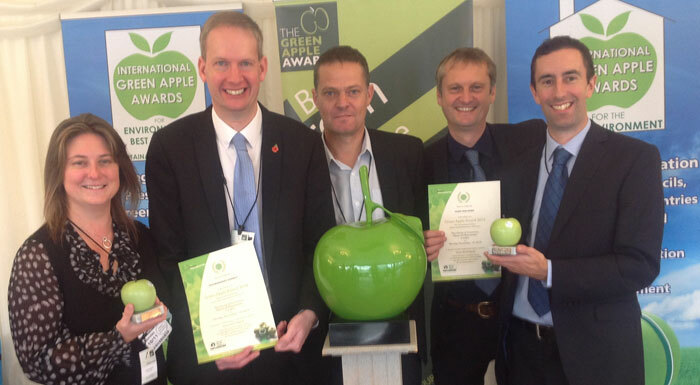 A delegation from Team Van Oord and the Environment Agency visited the House of Commons in Westminster earlier this week (10 Nov) to collect a Green Apple Award for Environmental Best Practice. The Green Apple Award was presented to the Environment Agency and Team Van Oord for the Medmerry Managed Realignment Scheme which has received a host of awards in the past 12 months. Launched in 1994 the Green Apple Environment Awards is now established as one of the world’s most influential environmental campaigns. The Awards are organised by The Green Organisation and supported by the Environment Agency, the Chartered Institute of Environmental Health, the Chartered Institution for Wastes Management and other independent bodies. The Medmerry Managed Realignment Scheme competed against more than 1,000 other nominations in the 2014 Green Apple Awards. The scheme will now feature in The Green Book, the leading international work of reference on environmental best practice, to enable others to follow its example and learn from the scheme’s achievements. Opened in November 2013, the Medmerry flood defence project involved the construction of four miles of new sea walls to reduce the flood risk to hundreds of properties in the area. The lifesaving defences held firm throughout last year’s floods and the scheme has been hailed as a gold standard of flood defence in the UK. The project also created a new wetland for local wildlife to flourish and much of the site is now managed by the RSPB as a nature reserve. By building this new form of defence, £300,000 per annum has been saved for the taxpayer and additional growth has been brought to the local area by allowing businesses to operate year round without the risk of flooding. • 2014 British Construction Industry (BCI) Awards – two awards, including the top award of the night, The Prime Minister’s Better Public Building Award, which is sponsored by The Cabinet Office. The other win was the Civil Engineering Project of the Year (£10m to £50m) Award. • The Environment Agency’s Project Excellence Award for Sustainable Resource Management. • The Institute of Civil Engineers South East Award for Environment & Sustainability. • The Chartered Institution of Ecology and Environmental Management (CIEEM) Award for Best Stakeholder Engagement, Best Practical Nature Conservation (joint winner) and the Tony Bradshaw Award in recognition of an ‘exceptional project that set an overall impressive standard’. • The Constructing Excellence Awards (South) for Innovation (and ‘Highly Commended’ in the sustainability category). Medmerry has also been shortlisted for the Chartered Institute of Public Relations (CIPR) ‘Pride Award’ for Community Relations, and the Constructing Excellence Awards (National) for Innovation, both of which will be presented later this month (Nov 2014).